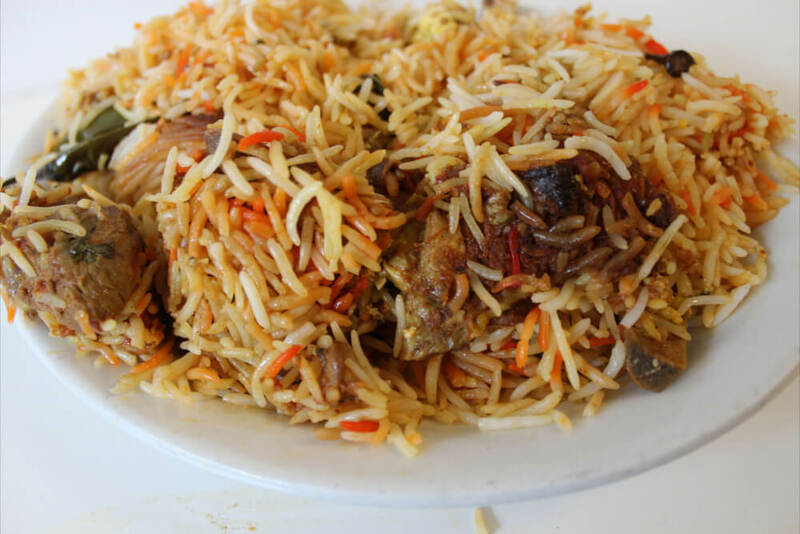 There is a fair bit of work involved in making an authentic biryani but recipes like this deserve to be made the old-fashioned way. If you don't mind putting a bit of 'elbow grease' into the preparation and making the dish from scratch, your reward will be something boasting the most amazing flavours. This recipe makes six servings. You will need to start making it a day ahead, since the pork needs to marinate overnight to infuse it with maximum flavour, then you can prepare the biryani the following day. This recipe makes a change from Indian curries - the staple dish of Indian food fans. 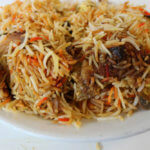 Biryani is a drier dish since it is not in a sauce, so it offers a different flavour and texture. This can also be served as one dish in an Indian buffet, perhaps with a curry, a vegetable dish and maybe some homemade naan on the side too. Toss the pork with the garlic, ginger, chilli powder, garam masala, coriander, mint, chillies and turmeric. Cover and keep in the fridge overnight. Put the onion slices in a colander and grind some salt over them to draw out the liquid. Let them sit for 15 minutes then rinse and pat them dry with paper towels. Heat the butter or ghee and oil in a big pot. Fry the onions for 10 minutes or until golden, then remove and drain the onions. Pour off all but about 2 tablespoons of fat from the pot (keep the poured-off fat). Now you can fry the meat in the pot until browned all over. Put the onions back in the pot and add the yogurt. Cook for 40 minutes over a low heat. Meanwhile let the saffron soak in the milk. Boil plenty of water in another pot (enough to cover the rice). Add the rice to the boiling water and cook for 5 minutes. Transfer the onion mixture into a heatproof baking dish (with a lid) unless the pot they're in is ovenproof. Drain the rice and spread it over the onions and pork. Drizzle lemon juice on top, along with the saffron milk mixture, and the reserved fat from before. Add a teaspoon of salt and a little water to the flour to make a dough. Roll it into a long, thin shape and press it along the rim of the pot or baking dish. When you put a lid on the dough, press down, and it will form a tight seal to keep all the steam in the dish. Bake covered for 40 minutes, then break and discard the dough seal before serving.